WCSA News: Have you seen?!? Have you seen?!? 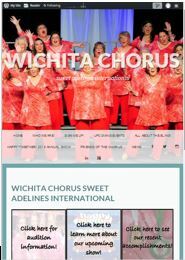 The Wichita Chorus of Sweet Adelines is proud to announce their updated website: http://www.wichitachorus.com. If you like the updated site, please share with your friends! Also, check back as the site will continue to be updated with Chorus activities.